How do I change EDUCBA User Name or Password? You can change your username or password through EDUCBA account settings. 1. Sign in to your EDUCBA account. 2. Go to "Account" and select "Change Password". 3. Enter both the passwords (old/new) in the appropriate fields. Click "Save" to confirm changes. Below is the given process to retrieve your EDUCBA username or password. 1. 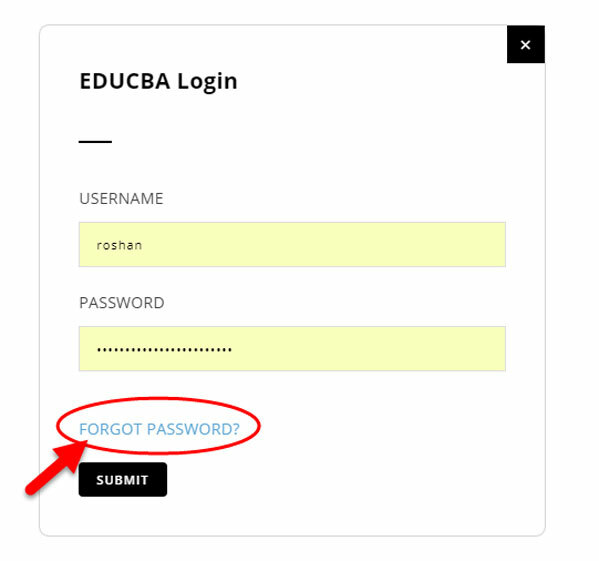 Go to https://www.educba.com/forgot-password/ to retrieve your password. 2. Enter the registered "Email Id" and click "Send". Soon You will get the details of your new password. My email id isn't working, What can I do? 1. You must be trying login with different email id. 2. Also if you mistyped your email id when you created your EDUCBA Account. You can also try resetting your password and try logging in to reset your password. What if I did not receive the confirmation email after registration. How can I log in to my EDUCBA Account? 1. If you did not receive the confirmation email, please do check your spam box. It must be because your email service provider is blocking our emails. 3. Try resetting your Password & create a new password. 1. Click on the "Login Button" in the above right corner. 2. Click on "Forgot Password"
3. Enter your "Email Id" associated with the EDUCBA Account. 5. Soon you'll receive an email with a link to reset your password. Can I Login to the EDUCBA Online Library from Multiple Devices? Yes, You can log in to the EDUCBA online library from any Devices, but you can only be logged in to one computer at a time. Simultaneously multiple logins are not possible at the same time. How do I update EDUCBA Profile? To update your profile, sign into EDUCBA account go to "Account" and Select "Profile"
Enter your full name which will reflect in your course completion certificate. What are your support options? We have "Live Chat Option" through which you can contact us, you can also contact us by phone at 09223233650 or you can contact us through "email" at info@educba.com. We will be glad to assist you. What is your support timings? Do you support all business working days? How do I renew my subscription if it is already expired? If your subscription gets expired, you don't have to worry. EDUCBA has an auto-renewal function through which you can access our course library unless you cancel it manually. Do I need to accept Browser Cookies while making a payment? Once you are done with cookies settings, close and restart your browser. If still the error occurs, restart your computer. How Secure are Credit Card Transactions on EDUCBA? Your credit card information will be secured when you complete your payment at EDUCBA. Your credit card information will be protected against hackers as we use the latest technology SSL. Also, your personal information will be kept secure by our server. What should I do if I get an error when I try to pay? Please make sure that you are using an approved payment method, which are Debit cards, Master Cards, PayPal. But PayPal will not work in certain countries. So you have to use our alternate payment gateways. You can also try using some other browser or device. You can try deleting your cache and cookies. I have made the payment, why my course access is not yet activated? Your course access is activated immediately once you make the payment. But when the status of payment is not reflected in our system or shows as failed, then your course access will not be activated. In such case, you need to drop us an email at info@educba.com, and we will update you within 24 hrs. If I cancel my enrollment, will I get a refund? If the cancellation is done by the delegate after registering, No refund will be made to the delegate. In case of third party courses, Once registered, No refund will be made to the delegate. What if my credit card was double charged for EDUCBA payment, what should I do? You don't need to worry if you have double charged from EDUCBA, you will soon get a refund. For that, you just need to drop an email or contact us so that we can resolve the issue. How much does EDUCBA course cost? Will I receive any Invoice/Receipt after making a payment? A payment receipt will be mailed to your registered email ID as soon as you are done with the payment. What are the Different Forms of EDUCBA Payment? We accept credit and debit cards backed by Visa, MasterCard, American Express, We also accept PayPal account payments and 2Checkout (For African Countries). Payment made through cheques and wire transfer are also available, for that you need to send an email us info@educba.com. How do I access EDUCBA online library and features? You can watch all of the courses in our online library. Course videos can be accessed through the EDUCBA website or on our apps for Android devices. We also offer a variety of learning tools, which include:- Popular Learning Paths, Most Searched Skills, My Free Courses, Customized course recommendations, Certificates of completion, and Course history. I am new to this online learning, How difficult it will be for me to get familiar with the online format? If you have never taken an online course before, you don’t need to worry. Online learning is very simple. EDUCBA provides free trial courses, which you can register online and start learning the course so that you get familiar with the online learning method. 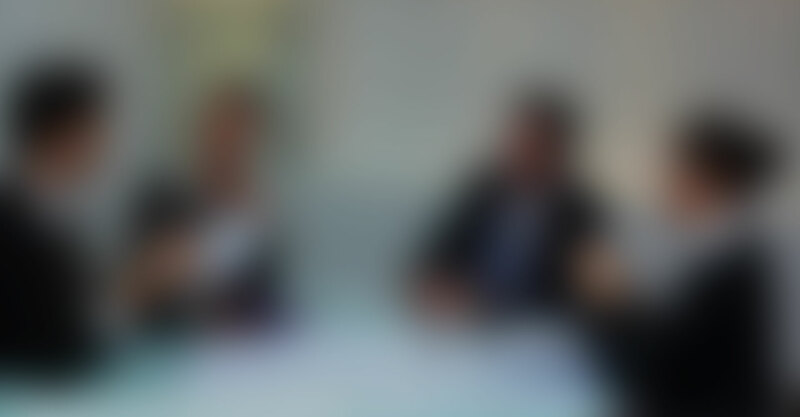 What all features I will get If I become EDUCBA member? Below are the benefits of becoming EDUCBA member. 1. You will get access to 5067 Courses. 2. You will get access to 202 learning paths. 3. You will get course completion certificates. 4. Any device viewing feature. 5. And offline viewing feature. Does EDUCBA provide Software that is used in the training? EDUCBA does not provide the software associated with course videos. And there is no need of any software to view our training videos, whereas if you want to follow along with included project files then you will need the copy of working software used in the training. Do EDUCBA provide comprehensive course content and support sufficient? Yes EDUCBA definitely provides a comprehensive course content which is delivered by an expert. We are sure, if you go through our courses, you will find it more comprehensive. How to mark or unmark the completed lectures? 1. Go to the "Course Dashboard"
How many courses does EDUCA have? When does EDUCBA add the new courses? EDUCBA daily publishes the new course. Where do I find the newly added courses? 1. Login to your EDUCBA account. And there you will find all the new courses. Right now, we are not offering any free courses, but we provide free trial access for 7 days. Here you will get unlimited access to all our courses. The total number of hours is indicative and it includes a total number of HD videos, additional readings that we provide, text materials, excel materials, and Projects, interaction with the trainers/coordinators and live webinars (If any). In short, it is the total number of hours we expect you to give to the course. So, in some cases, it's a little higher than the number of hours of HD videos. What are the different types of learning paths available? All types of learning paths i.e both the Professional skill paths and certification paths, for development, IT and creativity can be found on this learning paths page. Whereas Certification Learning Paths help you to focus on Certifications Exams, like Certified Ethical Hacker's Exam CFA Level 1, PMP, CCNA, HP QTP/UFT and Many. How are EDUCBA Learning Paths structured? Our learning paths provide a step by step structured sequence of online courses. Like how to become an I-banker, a web developer, a Hadoop expert, a project manager or anything else. Our learning path contains the number of courses which are based on different profession. But the courses that are available in learning path are from EDUCBA's library which currently has a count of 5067 Courses. When do EDUCBA releases the new learning paths? 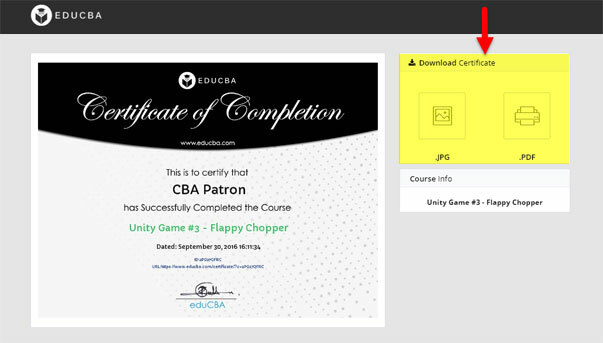 EDUCBA releases the new paths as soon as the majority of the courses are available. How are your courses different from the other online courses? EDUCBA provides the good and high-quality content. Our course content is delivered by expert trainers and from valuable institutes. So why to go for other, if you can learn the best from here. If you are having technical issues with EDUCBA, you can resolve it by clearing your cache and cookies, clearing cache and cookies are the first steps that you can try to solve your problem on EDUCBA. 2. At the same time, press "Control-Shift-Delete". 1. Open your internet browser, like Firefox or Chrome. 2. At the same time, press Command-Shift-Delete. If you don't want to clear your cache and cookies, you can also try using an Incognito browser, your problem can also be solved by doing this. If you are having a problem with EDUCBA Platform, like trouble in logging or not being able to see course videos, Then Our Technical Support team is happy to assist you with any kind of website issues you are experiencing. 3. Your Internet connection speed. 4. Complete details of the problem you're encountering. 5. The Screenshot of the error message you are seeing or of the issue(s) you are experiencing. We will research the problem and contact you as soon as possible. EDUCBA is committed to protecting the privacy and confidential information you provide in connection with your use of this website. EDUCBA is a self-learning resource, you can use the EDUCBA library catalog or the search tool to find the courses that fit your interests. If you want to learn more about the particular course, you can click the title and get the information and also see the upcoming sessions. Recommendation courses is another tool in which EDUCBA will suggest courses for you. I cant find the course I am looking for, what should I do? If you are not able to find the specific course or topic you are looking for, you can reach us at info@educba.com. If we do not have the training material which you have requested then we will submit the request to our content team. EDUCBA provides popular free courses which industries have demand for, taken up by the industry experts to provide you the glimpse of practice conducted in the corporates. How can I download course material? You can download the course material from the downloadable header in course dashboards. Does EDUCBA has an app? Yes!! EDUCBA have their own app, which is only compatible with Android Devices, Until now we don’t have IOS app, but we will launch it soon. Following is the Google Play Store link to download the EDUCBA learning app in your device or you can search "educba" in "Google Play Store" - https://play.google.com/store/apps/details?id=com.educba.www then, download the EDUCBA app, install the app and then you can log in with your username and password provided by EDUCBA. My video won't play. What do I do? 1. Closing and restarting the app. 2. Installing the latest updates from Google Play. 3. Updating your Android device's software to the latest version (4.4 and up). The EDUCBA app may be downloaded from your device's app store. Android: Google Play & Update the same. Does EDUCBA App have Offline Viewing Feature? Yes from EDUCBA App you can download course videos for offline viewing and learn at any time and at any place. How to make payments From the EDUCBA Mobile App? If you make a payment using the EDUCBA mobile app for an android device, you'll directly pay on the checkout page. To make a payment you can use any accepted payment methods or any other saved card from your account. 2.Go to the Subscription Settings. 3. Click on "Cancel Plan" button. 4. Click "Confirm" to cancel your Subscription. Getting an error while downloading EDUCBA course videos, It must be due to a number of issues, which includes your limitations of the Android operating system, bandwidth limitations or background actions For better results, we suggest you leave the app open until the course videos are fully downloaded. How do I access EDUCBA course history, In the mobile app? Do EDUCBA have Playlists feature, In the mobile app? The EDUCBA apps for mobile devices have a new feature to make and edit playlists. You can add courses to your playlists by tapping the Add icon next to the course title. What Are Features available in EDUCBA App? At eduCBA, it is a matter of pride to us to make job oriented, hands-on courses available to anyone, anytime and anywhere. Therefore, we ensure that you can enroll 24 hours a day, seven days a week, 365 days a year. Learn at a time and place, and pace that is your choice. Plan your study to suit your convenience and schedule. Some site features, such as exercise files, transcripts, bookmarks, and account maintenance are not currently available on the app. 1. Login to your EDUCBA account & Click on "My Account Page" on the right-hand side corner and then go to "My Certificates Tab". Do I need to give a certification test to get my course certificate? There are certification tests for certain finance live projects you enroll for. otherwise, all the courses are granted certificate particularly when you complete viewing all the course videos, such do not have any test to get your course certificate. How do I change my name on my course certificate? The name on the course certificate is the one which you have used for your ID verification. If you had made a mistake when setting up your ID verification, then you can request a name change. Below is the simple process: Before generating the certificate you need to update your name in "Profile" option and then you will get the certificate as per profile name. Do EDUCBA offers free certificate? No. We do not have an option of earning a free certificate. If you have completed all the required assignments in a course and if you are still not being able to get a course certificate, this may be because you may not have successfully completed the course. Please check to make sure that you have fully completed the course. If still, the problem occurs, you can drop us an email at info@educba.com. Is there any course certificate deadline? No. There is no deadline to take the EDUCBA Course Certificate, you can download or print it at any time and at any place. What kind of subscription plan is required to get Certificates? You will get certificate only on our premium plan. For what type of courses does EDUCBA offer the Certificate? Do EDUCBA provide the certificate after completion of learning path? Yes. We do provide a certificate of completion of the learning path. What does EDUCBA course certificate include? 2. Logo of the online training Institute i.e EDUCBA. 3. A verification URL that allows others to check the certificate's authenticity. 6. A statement that EDUCBA has confirmed the identity of the learner who completed the course successfully. What does EDUCBA Course Certificate Does not include? 1. The number of hours you spent working on a course. 3. The grade you got in the course. 4. Printed or email a copy of the certificate. How do I create my EDUCBA Playlist? 2. Click "My Playlist" at the top of the page. 5. Click on "Create Playlist Button"
How do I create my playlist and also how can I add EDUCBA Courses to my Playlist? If you wish to add EDUCBA courses to your playlist. 1. login into "EDUCBA Account". 2. Navigate the mouse cursor to the course you wish to add to the playlist and click on "Add to Playlist Button"
4. Enter the playlist name & click on "Create Playlist"
Do EDUCBA provide exercise files for each course? Most of our courses have the exercise files, based on what is necessary for the course. All of our courses do not provide exercise files, it will vary by topic. How can i download the exercise files? We provide exercise files almost for all courses if relevant. Below are the following steps to download our exercise files. 1. You need to browse our course library and select the course which you want to learn. As shown in the snapshot below, we have selected the financial modeling course, here you can see on the left-hand side in the curriculum section. Click on the first video in the curriculum section, as shown in the snapshot below, then click on the "Reference File". And then, download and extract the zip file. What should I do, if the exercise files I downloaded are not working? Check whether you have successfully downloaded the exercise files. Or you can also email us at info@educba.com. We will confirm your issue and make sure our content team will make necessary corrections. Exercise Files Not Appearing for my Course, What should I do? We provide exercise files for almost all course if only its relevant. You can also make sure that you have an active subscription plan. If you have the subscription plan and still not being able to access the exercise files, then you can drop us an email at info@educba.com. We will further look into this and work with our team. Do EDUCBA offer subtitles or closed captions with your course videos? Subtitles or closed captions are in progress and we have already added them to few courses. Since it is a long process it will take some time before all the videos run subtitles. We would appreciate your patience with us in this. What should I do if the videos are taking more time to load? Does EDUCBA provide an autoPlay feature for their course videos? Yes EDUCBA do provides the autoPlay feature to their course videos. I have audio problems with EDUCBA course videos, what to do? 1. Try increasing and lowering the volume of your inbuilt speakers. also, check for the speakers are plugged in properly. 2. Try a USB Headset. 4. Try restarting the computer. Which software do I need to install on my computer in order to view videos from my web browser? There is no need for any specific software installed on your computer, as our web player is totally based on HTML5. To use our HTML5 player, you must use a recent version of the browsers (Chrome &FireFox), or any other. Do you have video playback speed and slow back speed option in the EDUCBA Android App? Yes, you can adjust your video playback speeds from x.5 to x2.0. You can do this by launching our web player, click on the speed icon in the lower right corner of the video player. And select the desired speed. How much bandwidth do I need to play my course videos? Your bandwidth/internet speed must be up to 2mbps for watching EDUCBA videos and to avoid buffering. If you have less then 2mbps then we would like to recommend you to use our offline player. If you are running into a video buffering issues on the educba.com, Please make sure that you are using a supported web browser. Try using a different browser like chrome or firefox. Also, do check if you have activated any extensions, some of the browsers interfere with extensions. Also try clearing your cache and cookies, remove the add-ons, restart your computer and try again. If these steps are not working then you may need to update your Flash Player.